For the Canadian version of this channel, see NBA TV Canada. NBA TV is an American sports-oriented pay television network that is owned by the National Basketball Association (NBA) and operated by Turner Sports. Dedicated to basketball, the network features exhibition, regular season and playoff game broadcasts from the NBA and related professional basketball leagues, as well as NBA-related content including analysis programs, specials and documentaries. The network also serves as national broadcaster of the NBA G League and WNBA games. NBA TV is the oldest subscription network in North America to be owned or controlled by a professional sports league, having launched on March 17, 1999. As of January 2016, NBA TV is available to approximately 53.8 million pay television households in America. The highest measured audience was a Golden State Warriors vs San Antonio Spurs regular season game on April 10, 2016 with an average 2.6 million viewers. The network launched on March 17, 1999 as nba.com TV; the channel, which was renamed NBA TV on February 11, 2003, originally operated from studio facilities housed at NBA Entertainment in Secaucus, New Jersey. The network signed a multi-year carriage agreement with three of the U.S.'s five largest cable providers, Cox Communications, Cablevision and Time Warner Cable, on June 28, 2003; this expanded the network's reach to 45 million pay television households in the U.S., in addition to distribution in 30 countries worldwide. After Time Warner shut down the sports news network CNN/SI in 2002, many cable providers replaced that network with NBA TV. The network mainly launched with two purposes; to serve as a barker channel for the league's out-of-market sports package NBA League Pass, along with featuring statistical and scoring information which was more easily accessible in the pre-broadband age, and it featured mainly archival content from the NBA Entertainment archives in its upper pane to fill programming time. As time went on, the network added more programming, including international basketball leagues and programming from FIBA usually unseen in the American market. The programming mix and channel format changed around the same time of the CNN/SI shutdown. On October 8, 2007, it was reported that the National Basketball Association would transfer the channel's operations to Time Warner's Turner Sports division (operated by the company's Turner Broadcasting System subsidiary). Turner took over the channel's operations on October 28, 2008, and began using the same announcers and analysts used on TNT's NBA telecasts. Analysis and news programming also received an upgrade, with production of the programs being relocated to Studio B at Turner Studios in Atlanta, Georgia, located adjacent to Studio J, where TNT's post-game program Inside the NBA is broadcast. On April 16, 2009, DirecTV announced that it had reached a carriage agreement with the NBA to continue carrying NBA TV, moving it (and out-of-market sports package NBA League Pass) from the satellite provider's Sports Pack add-on tier to its lower-priced Choice Xtra base package on October 1, 2009. DirecTV believed the move will make the channel available to an additional eight million subscribers. On June 4, 2009, Comcast announced that it had reached an agreement with the NBA to move the channel from the cable provider's Sports Entertainment Package to its basic level Digital Classic package, by the start of the 2009-10 NBA season. Like DirecTV, Comcast estimated that an additional eight million customers would effectively gain access to the channel. Verizon FiOS added the channel and NBA League Pass to its systems on September 23, 2009. The network also signed new multi-year agreements with Time Warner Cable, Cablevision and Dish Network on October 22, 2009, as well as a renewal agreement with Cox Communications earlier in the year. With all of the above carriage deals, the NBA estimates that it would increase NBA TV's overall subscriber reach to 45 million pay television homes. On October 29, 2010, AT&T U-verse reached a carriage deal to carry the channel's standard and high definition feeds. NBA TV is not available to legacy Charter Communications customers using outdated billing plans, which carried the network as NBA.com TV prior to 2004, due to unknown carriage conflicts; NBA League Pass is also not carried by Charter (on May 18, 2016, Charter acquired Time Warner Cable and Bright House Networks for $78.7 billion, which both carry the network). NBA TV is available to Charter households where available as of February 2017, if a customer switches to the new 'Spectrum' billing plan which united Charter, Time Warner Cable and Bright House Networks under the Spectrum branding (this is all likely unrelated to Charter's inherited naming rights of the Charlotte Hornets' home arena, the Spectrum Center). NBA TV offers news programs devoted to basketball daily, in addition to programs showcasing the lives of individual basketball players, documentaries focusing on a particular NBA team during the season and archived broadcasts of well-known games. NBA TV carries at least 90 regular season games per season, which typically air four days a week during the NBA season (mainly on Mondays, Tuesdays and Saturdays, although occasional Wednesday, Friday and Sunday games may air in the event that ESPN does not hold rights to coverage on those nights), as well as some first-round playoff games. Live games on NBA TV are subject to local blackout restrictions, since NBA TV (despite being owned by the league) does not hold the exclusive broadcast rights to any of its games. Games carried by NBA TV are also carried by each team's local rights holder, either a regional sports network or a broadcast television station. Beginning with the 2012-13 season, the score box displayed during NBA TV's game coverage (which was seen on the lower-left hand corner of the screen) changed to a banner format oriented horizontally across the screen. However, the network does not use timeout or bonus indicators like that seen on the score graphics used on ESPN and TNT. The network also shows international games, typically on Saturday evenings, with special emphasis on the Euroleague and the Maccabi Tel Aviv team from Israel. In April 2005, NBA TV televised the Chinese Basketball Association finals for the first time. The channel's flagship program is NBA Gametime Live, a program focusing on news headlines within the NBA and related leagues (including the WNBA and G League), highlights and look-ins at games currently in progress presented by a host and studio analysts. The show airs live six days a week, deferring any TNT game nights outside the playoffs to repeating that evening's edition of Inside the NBA. An edited 90-minute version of the broadcast is repeated during the overnight and early morning hours. On October 11, 2017, it was announced that the Players Only franchise, which made its debut last season on TNT, will show live games on NBA TV, starting October 24, 2017 and every Tuesday after that, for the first half of the 2017-18 season before transitioning to TNT for the remainder of the regular season starting January 23, 2018. NBA TV HD is a 1080i high definition simulcast feed of NBA TV that is available on most providers. All studio programs and original programs are shot in HD, and all live games and recent game rebroadcasts are televised in HD. During certain programs that are not available in HD (such as older game footage), unique stylized pillarboxes are used, displaying the NBA logo with the "NBA TV" text under it, or alternatively, just the "NBA TV" or “NBA HD” text oriented sideways, both shown in black and gray. The studio host and analysts vary on each night's broadcast of NBA Gametime. NBA TV Canada, a Canadian version of the channel, carries some of the same game broadcasts as the flagship U.S. service, ESPN, and TNT instead of the secondary game package found on NBA TV International. In October 2010, NBA Premium TV was launched in the Philippines. It is a redirect broadcast of NBA TV and airs locally televised and nationally televised games in the United States. 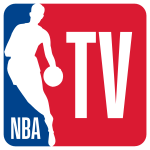 In February 2012, NBA TV International was made available on NBA.TV as an internet subscription channel outside the United States. On beIN Channels Network in the Arab World, NBA TV itself is not available. However, beIN Sports NBA is a separate channel in HD which airs several of the same games broadcast on NBA TV. NBA TV was criticized in the past for its first-round playoff coverage merely passing down the broadcast of a game from a regional sports network for national broadcast, amplifying the chosen team's broadcast and bias for said team to a national level. Beginning with the 2011-12 playoffs, NBA TV began to produce a full and neutral national broadcast for those games. ^ "Cable network coverage area household universe estimates: January 2016". ^ "Turner promotes NBA digital menu". 2008-10-06. Retrieved 2008-10-15. ^ a b c NBA digital signs deal with FiOS for NBA TV and NBA League Pass TVWeek.com September 23, 2009 Cite error: Invalid <ref> tag; name "oct22" defined multiple times with different content (see the help page). ^ "Pressroom". Turner. Retrieved 11 October 2017. ^ "Turner Newsroom: NBA.com Host Kyle Montgomery". Retrieved 11 March 2011. ^ Yoder, Matt (27 April 2011). "Gary Neal's Buzzer Beater And The Sounds Of Silence". Awful Announcing. Bloguin. Retrieved 2 May 2011. ^ Yoder, Matt (23 April 2011). "Should NBATV Use Local Announcers For Playoff Games?". Awful Announcing. Bloguin. Retrieved 2 May 2011. ^ Hiestand, Michael (2012-04-22). "Hiestand: NFL draft loses some spontaneity". USAToday.com. Retrieved 2012-04-23.